A picture, above, from Tea Time magazine just came to my inbox. 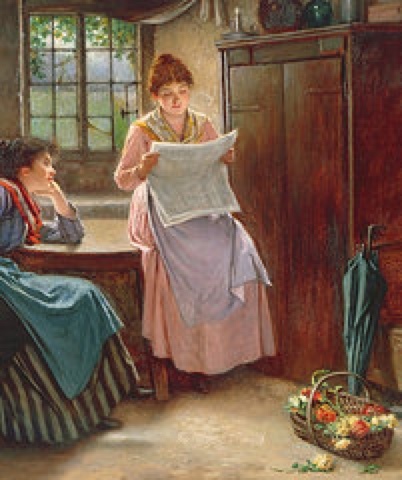 It's brightness caught my attention and yet this calm domestic scene is assuring. I am so busy at home and outside but I hope to wrote more about creating the culture you long for, that you cannot find in the world, at home. Photo: my view these last few days. 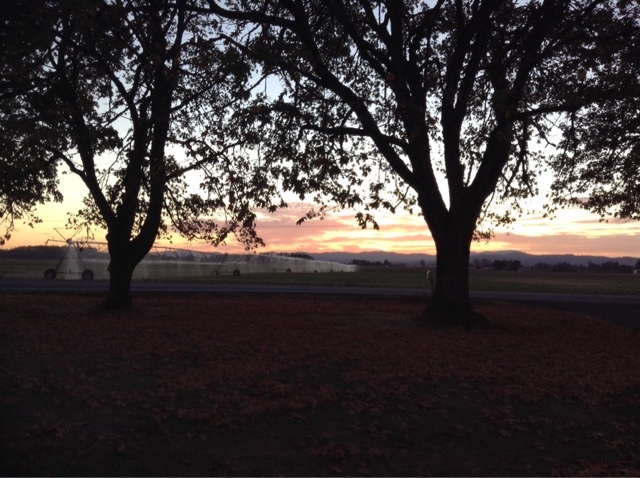 The harvest is past but a new crop is growing and the sprinklers are going day and night. Believing God has willed it so. I am posting some of Edgar A. 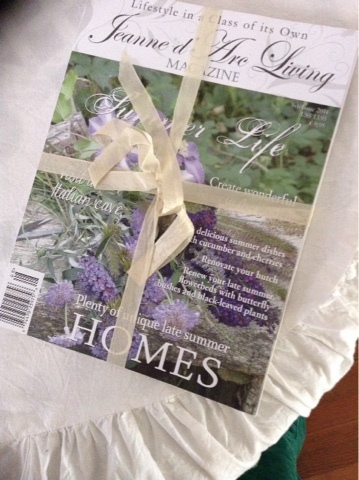 Guest's poems about the home and family because I believe home life needs so much more prominence in a people's minds. Guest's poems emphasized the importance of the basic foundation of the home in people's lives, and that nothing is really more important. I believe reading this aloud will help emphasize the points much more, and his poetry should be read aloud in the family.His poems should be read over and over to instill in family members the importance of the family they are in, and how they can help to keep it strong and keep it a place where they belong; how little things, bit by bit, have meaning and contribute to the strength and importance of the home. The old high chairs, the playthings, too, the little shoes they wore Ye hoard; an’ if ye could ye’d keep the thumbmarks on the door. I have read poem aloud and recorded it on my computer but have not quite figured out how to post the recording here. Any help you can give me will be appreciated. A circle at the fireside that no power on earth can break. There are rich folk, there are poor folk, who imagine they are wise. And they’re very quick to shatter all the little family ties. Each goes searching after pleasure in his own selected way. Each with strangers likes to wander and with strangers likes to play. Are the brothers and the sisters, who together share their fun. There you find the gladdest playground, there the happiest spot to live. The poem has something in it for all family members; reminding them to treat the family as something extraordinarily important, created just for each other. Let us be careful to treasure the family, and teach children to be kind and loving to everyone, for there is no substitute for the home that was created for them. It is one of a kind, tailor-made for us. It has been a full day here at home and to make it more interesting I have taken some photos aside from the daily work and all thing things that go into looking after the family. 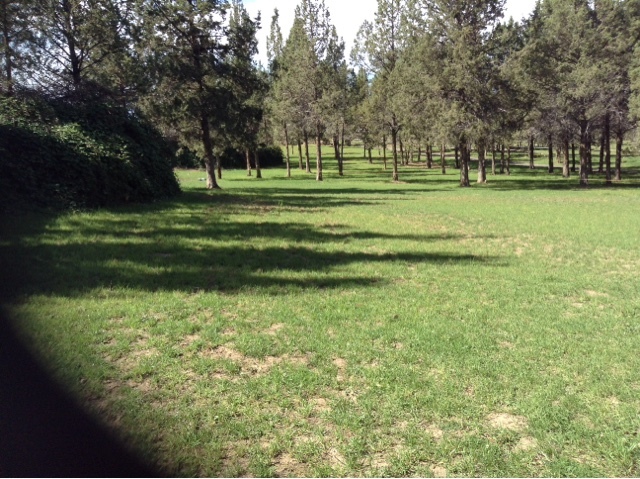 It is these bright spots that express some of the happiness of the home. 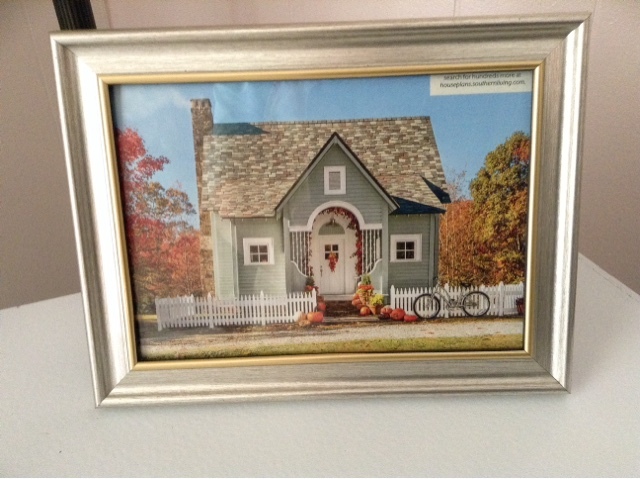 Above is a sample of something our parents used to do back when framed pictures were so unaffordable: they would take a picture out of a magazine and frame it using frames purchased at K-Mart or the dime store. To cover up the description on the upper right corner, I could always paste a few fall leaves over it. 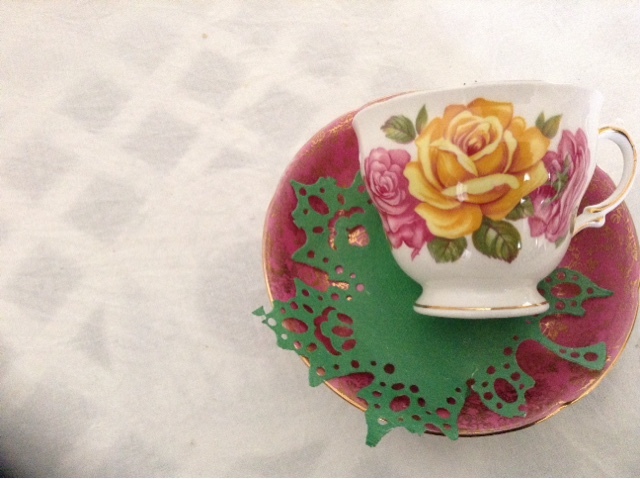 An orphan teacup I found at Goodwill for 80 cents is paired with one of my unmatched saucers. 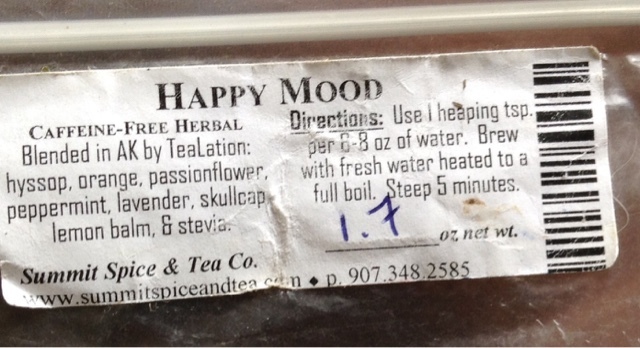 This is the best herb tea, called Happy Mood. At a little fabric store I found a series of quilt fabrics featuring antique postal prints of postcards, old letters, stamps, etc. 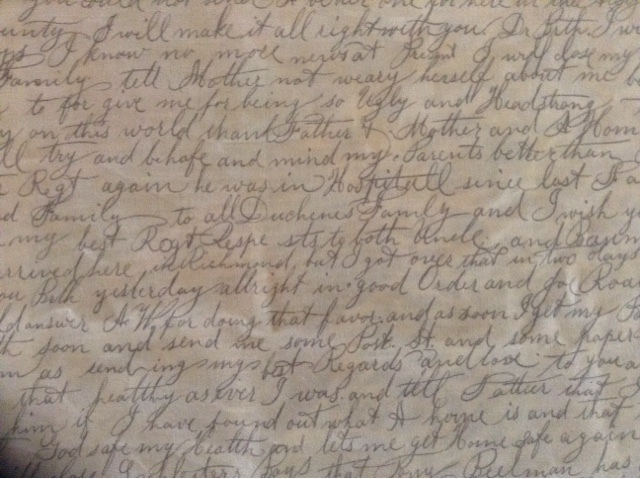 I started to read this letter from a young man in the Confederate army in Richmond. I kept walking back to that section of the store to read more. Finally I bought half a yard of it so I could figure it out at my leisure. It says in part: "Please tell Father that I beg him to forgive me for being so ugly and headstrong, and tell him I have found out what a Home is and that nobody on earth has better parents than I do and Please pray God saves my health and let's me get home safe again." Written over a hundred years ago, it still expresses what all of us feel when we are away from our dear parents and siblings. We recycle our cast-offs among our friends and family. Above is a wired vine someone was tired of, after using it for a decade. 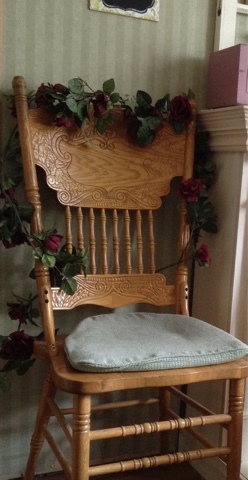 Winding around the chair back, it looks quite cottage! 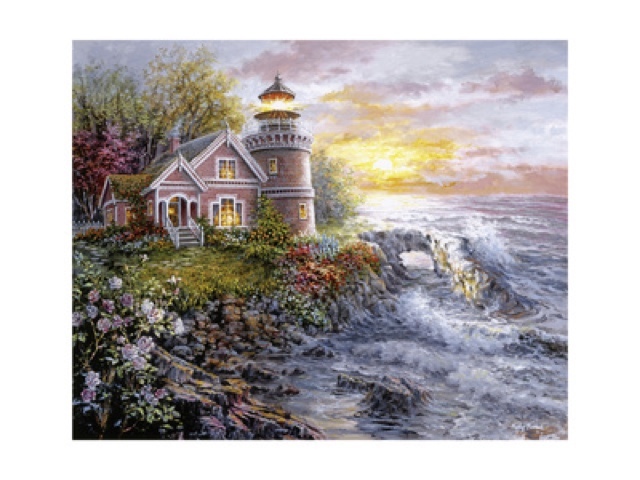 Speaking of cottage, a cereal box as a base can be used to make these cottages. 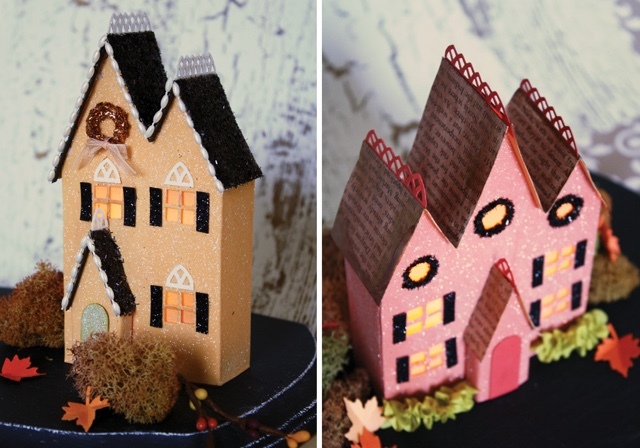 Covered with fancy papers and embellishments, these little houses would look good on a shelf or mantel. Instructions are at the Victoria magazine blog. Someone sent me this magazine from 2014 and I have been too much on the go to sit down and look at it. I am looking forward to seeing the contents of this publication from Denmark. You have heard the expression "castles in the air". 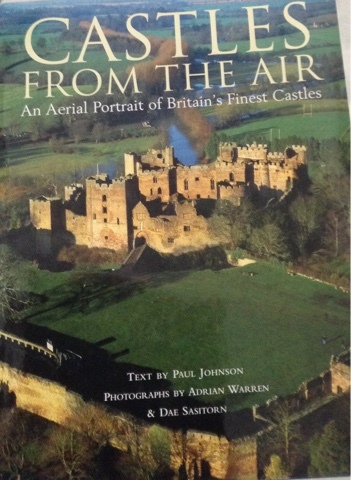 I saw this book called Castles From the Air" at Costco and thought it was fascinating but expensive. I found it at a thrift store for $6.50. It feels so rich and elegant to have a book on castles gracing my coffee table. 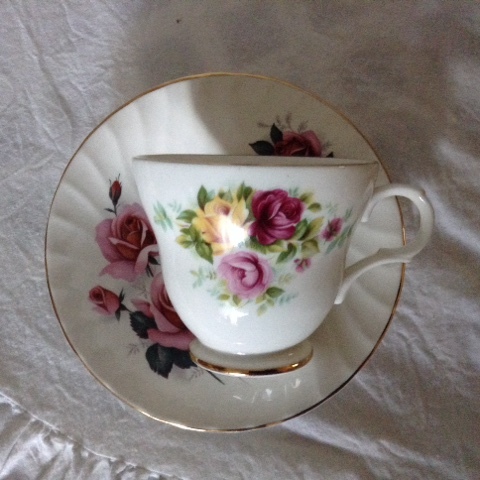 Another find, below: the saucer and cup are not matching pieces, but the two pieces look about right together. And the little parlor windows with the curtains white and straight. And the simplest of the blossoms seems of mighty consequence. That can rest a weary pilgrim like the little place called home. And the wine of pomp and glory soon grows bitter to the taste. Like the laughter of the loved ones in the happiness of home. After a day away for a sweet picnic, the aftermath of unloading everything from the car reminded me of what ladies of the home face when they come home from a day out! The packing up was a neat and tidy effort and very fast and simple! Setting up everything outside was also easy and simple. It got more complicated when it all had to be brought back into the house, and I got home after 10:00 in the evening because of a detour on the road. Consequently I was not able to re-organize and put everything away. There are plenty of things on the web for homemakers on how to get back into being organized after there has been an event of some kind, so I am sure this is no expert advice, but I want to share how I get going again when I have several piles of things that need putting away, pots and pans to wash, floors to clean, and company coming to my house the next day for teatime. The first temptation is to cancel the company but they aren't apt to care what my house looks like so they would not take that as a good enough excuse! If you can't get started with your duties at home after a day out, the first thing most experts that I have read recommend is "appearance before anything!" It means shower, dress as well as you can (grungy clothes will make some people depressed before they even begin their work) good shoes that don't hurt your feet, a pretty apron, do your hair, makeup, and even wear pearls if you want! The next thing is a fine cup of tea...and then write a little list, then breakfast preparation, and off you go. I also make my bed, even though other things seem more urgent, especially the chaos in the living room, the bed will be a surface for temporality ferrying aside some of the clutter. Then at night the bed is already made and all I have to do is remove everything. But for the day, it is a good storage area. Around the house, choose the most important room first. As I am expecting company, I will do the room nearest the front door, first. If I run out of energy or have an interruption, at room will be presentable and I can put other rooms off limits and no one will know. I take baskets of things that need to be distributed to the right places, and park them out of sight. That way at least the front room is presentable. I will go back to those collections once the main work is finished. The next thing is tidying up the bathroom, because there is a chance it will be the first room that is visited after someone arrives. And of course the kitchen, because that is where I will be preparing the tea and the ladies will bring their empty plates and cups before they leave. The other rooms, such as sewing room, bedrooms, laundry room, can be closed off and I can work on those later. Lord willing, I will do them all as well. 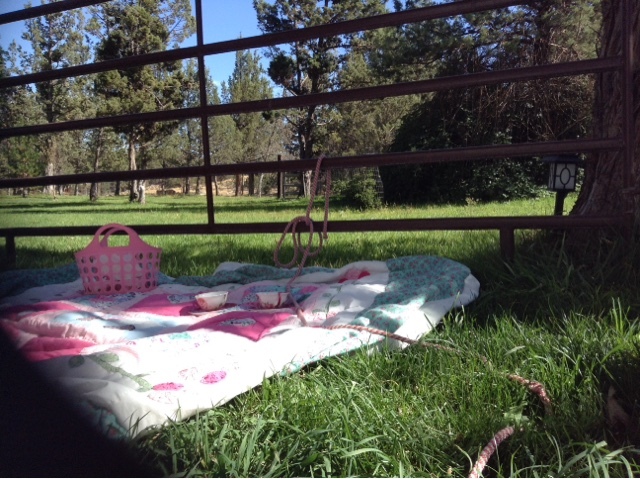 This is the quilt I took for the picnic, one I made about 20 years ago. In those days there was a "worst quilt contest) based upon how your quilt hung, and if it sagged and stretched and in general didn't match up with the squares and borders. I didn't enter mine in he contest because it would not have been fair to the others :-). 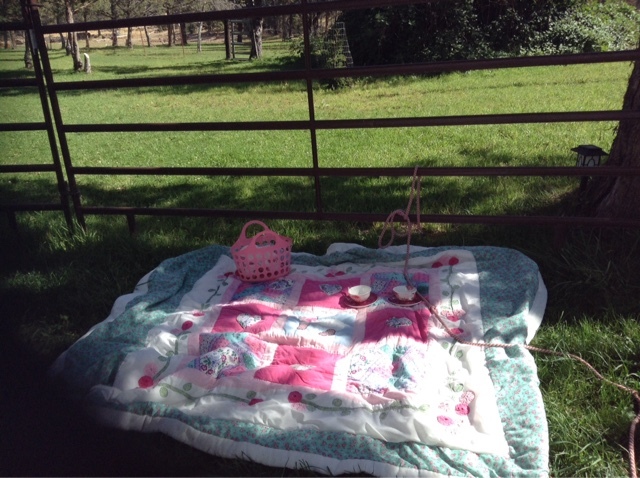 I found it very useful as a car blanket and a picnic quilt, and after many washing and wearing a it actually has settled down, with no pulled corners and no sagging areas, and looks okay. So don't get rid of all your mistakes. For a few years I hung it on a quilt rack, showing only the good areas, and now it all hangs quite well and when put on a bed it has none of those original flaws. It is the favorite blanket in my home. The corners and borders were vines and flowers; the flowers made from those gathered circles of fabric. 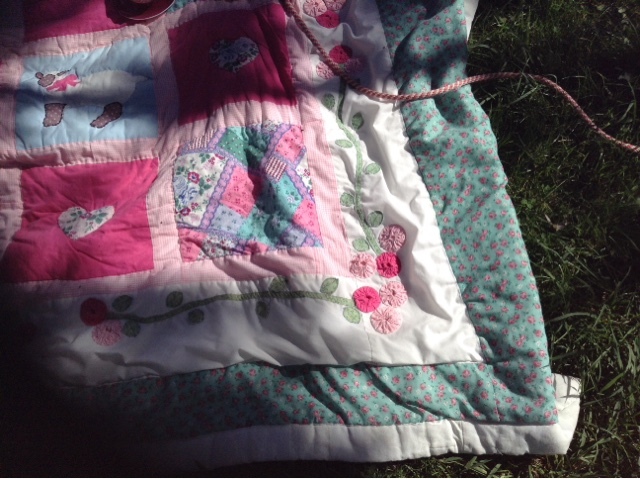 You can still see some pulling and sagging on the borders but it's a lot better than it was 20 years ago, and I HAVE improved my quilting skills! This was horse country but there were only a few I saw through that iron gate, and they didn't come near. 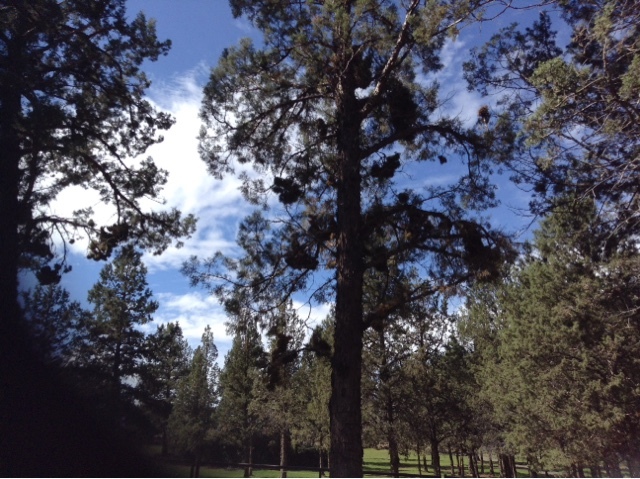 The sky was so lovely through the tops of the trees. 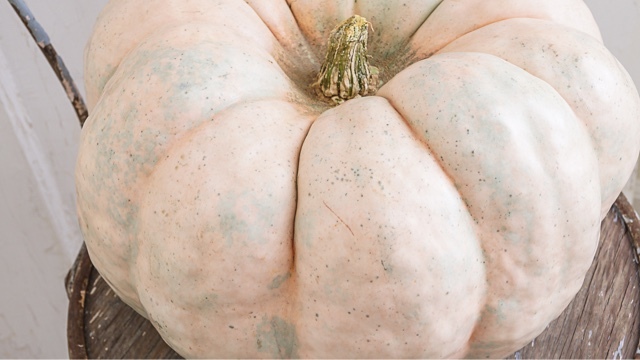 I am looking forward to seeing if I can get the pink porcelain doll and the blue doll pumpkins this year. If they are expensive I will attempt making them of cloth. And when all the mess is put away, go in the room and look at it and say, "It is good." Create a bit of beautiful indoor scenery for yourself by making each room tour-ready. 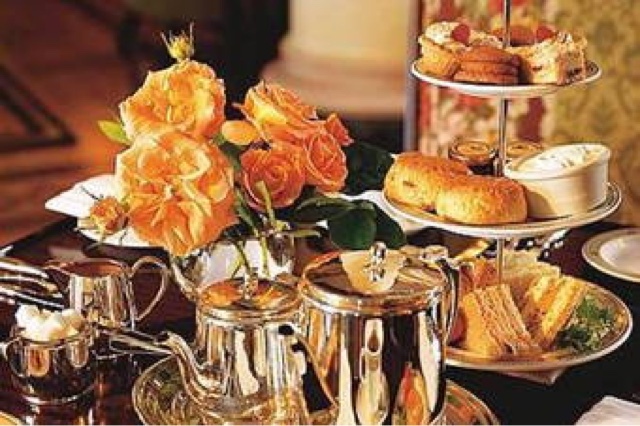 How much tension could be eliminated by the act of afternoon tea, that moment of respite from the duties of the day. 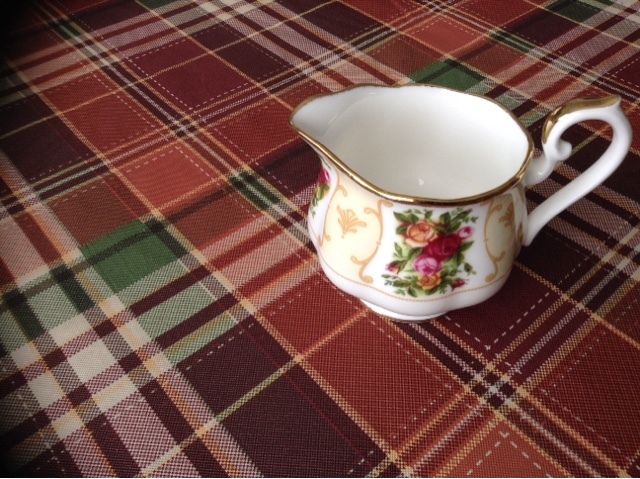 I had an aunt who, upon facing a challenging decision, would immediately take to her teapot and get it ready for a semi-formal sit-down tea moment. 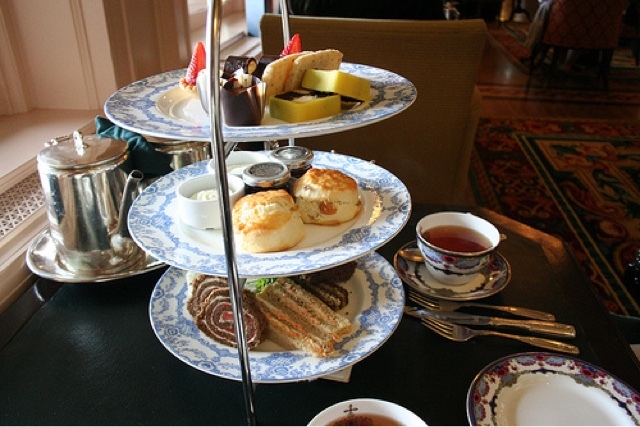 (All tea photos from the Fairmont Hotels around the world). Financially and distance-wise, it is not always possible to go to tea, but there is another way of getting out of the house: tea time on the porch, or another room, little nook or cranny, corner of a room, or a tea area set up in front of a window so you can enjoying seeing out. 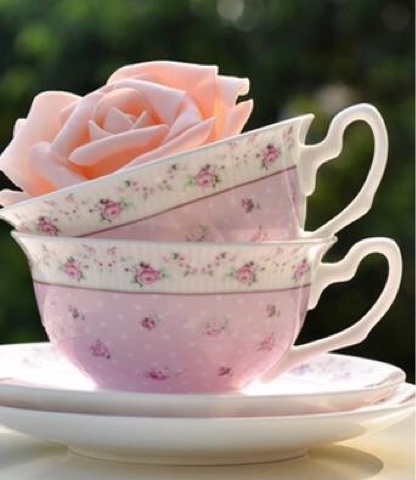 My aunt always said "Tea" when snags or little upsets came upon her home, but tea time is such a soothing and elegant relief, it should perhaps be practiced every day before stresses arrive. Some ladies claim they have no time for tea, or they do not like tea, but there are many ways to use that nice tea cup for other hot drinks. 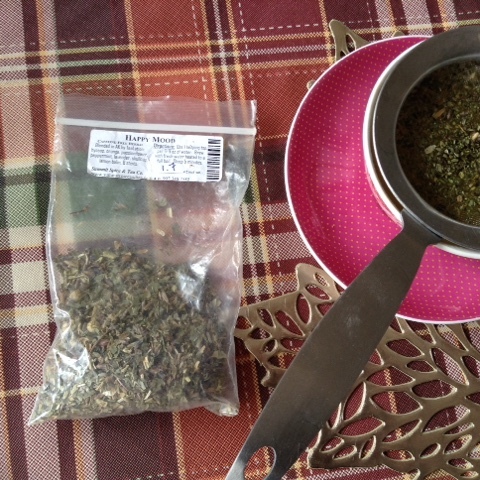 I have showed you how to use berries and fruit, mint and other garden herbs to make a tea. There is more to taking tea than the beverage itself. The act of hovering over a small table or tea tray and ceremoniously pouring and hearing the tune of the teaspoon on the porcelain cup, using all the tea accrouments, etc. 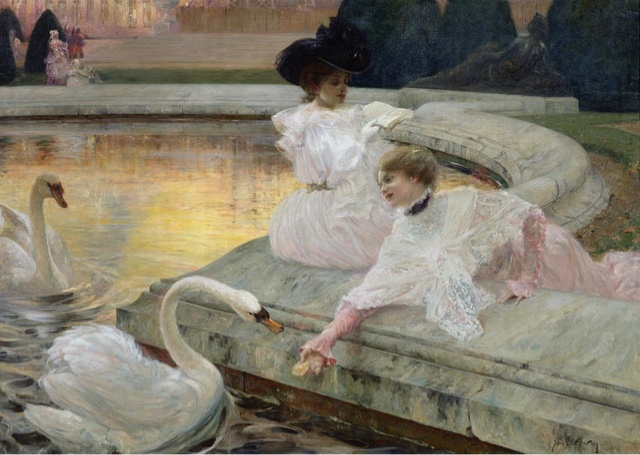 that evokes a feeling of luxury. 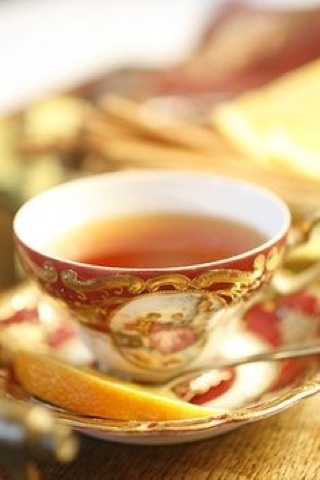 Tea is usually taken in small areas where people may converse and enjoy each other's company, bringing closeness and friendship to lonely people. Many of us may never get to the Empress Hotel for tea, but we can create just as good or even better moments in our own dwelling places. How much needless nervousness could be avoided if one would stop for tea, no matter what is on her mind. This brings me to the little lecture that has been formulating in my mind all week: Do not forget to live. Do not put off doing things that would bring balance to your mind, whether taking tea or taking pictures, and, if you like cleaning cupboards or sorting books in a shelf, do not wait til life settles down. Do not wait til your finances get better, your family life gets better, your marriage gets better, your country gets better, the church gets better, the town gets better. People neglect the afternoon tea stop because there is so much to do. They do not feel right if there is unfinished business and they stop and have a cup of tea. Eventually we all get a little wiser after we have seen that life around us and the world is never going to be as beautiful as we want it to be, and we make our own beauty and sweet moments at home. We realize there will always be laundry and dishes to wash, floors to mop, unfinished sewing, plus our long lists of things to do. 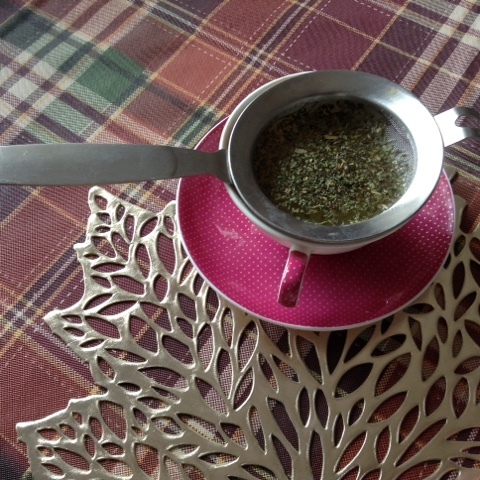 Some people, like me, are reluctant to take tea if the house is not in order. We fnd it hard to relax in a mess. Keeping one corner of a room clutter-free and one table clean, or having a tea set in a tray that can be transported anywhere indoors or outdoors, can be the solution. We start to create the memories we want our children and people in our lives. What will your children remember? I would urge you to make tea time one of their memories, and do not save it for special occasions, but set it up using your finest tableware, and take pictures for your memory book. 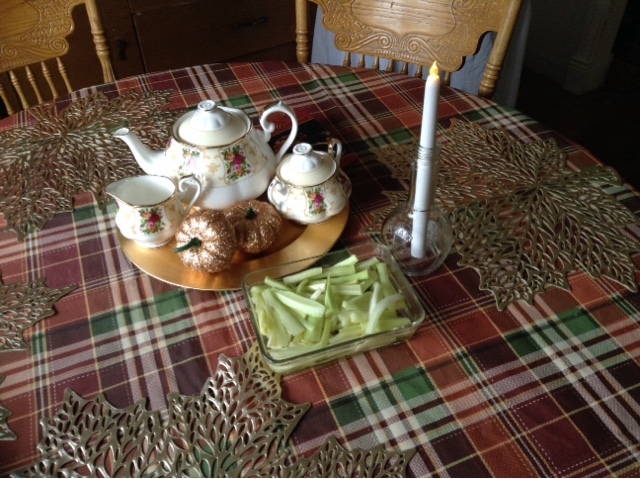 I have set my dining table for afternoon tea and begun getting the snacks ready. 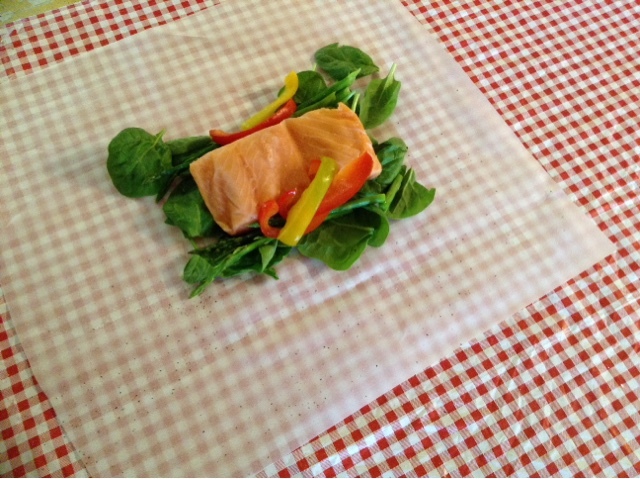 The leaf placemats come in several metallic colors and are available at Walmart and BiMart. I chose the platinum color, but the other choices were very bright and it was hard to decide. 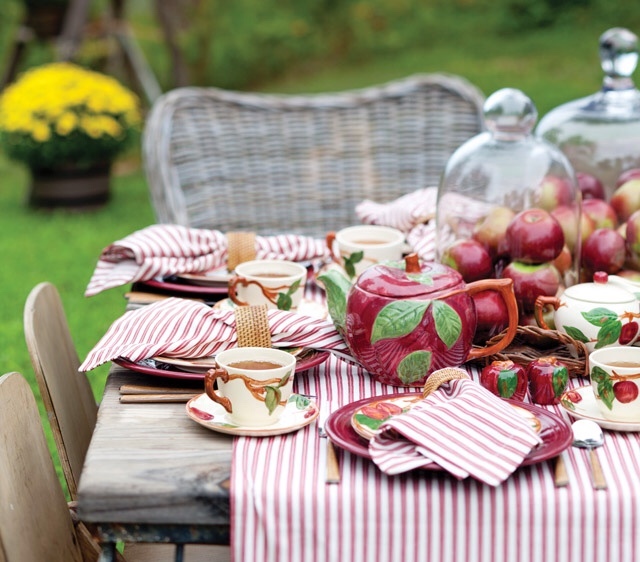 If you only need two or four for your tea table, it need not be expensive. 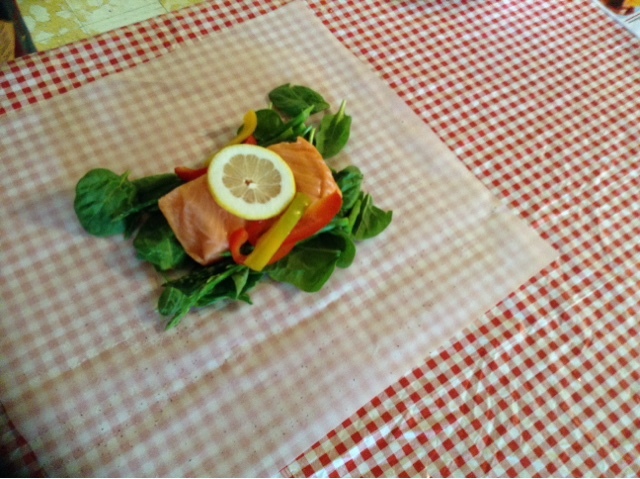 The placemats are under $2.00 each. Check your Dollar store for other leaf placemats. 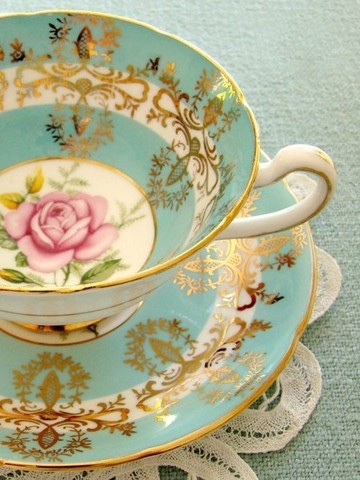 If you have moments of restlessness or discontent, be sure to stop for tea. Sometimes people's moods are softened by the event, and if you can, invite someone to join you. 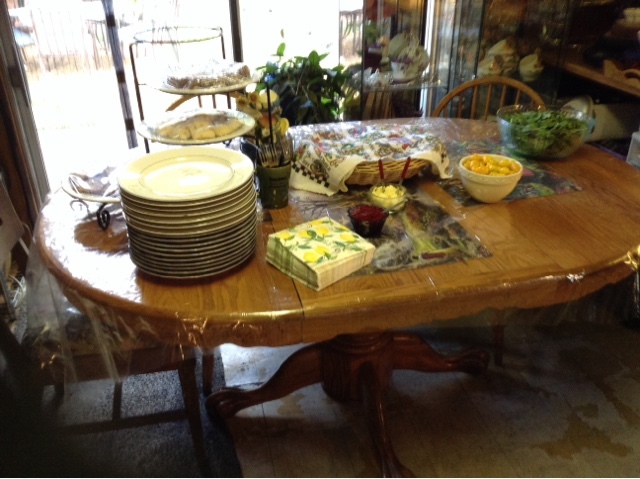 A friend invited the ladies class and friends to her house for a cooking show. 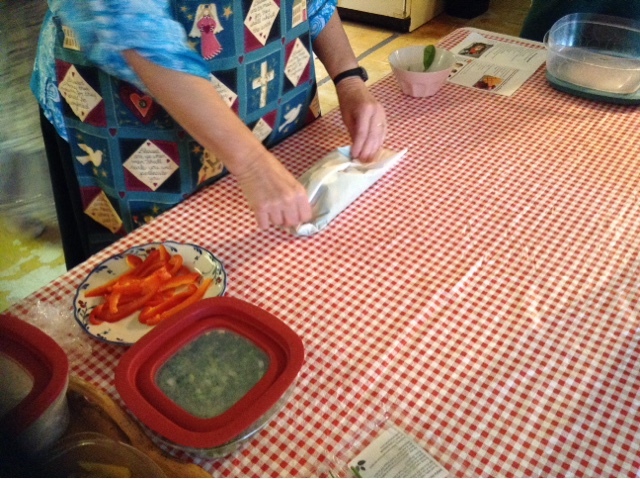 She based her lesson in the many Biblical references to food, both physical and spiritual. As we are always keen on identifying figures of speech in the Bible (similes, metaphors, personification, hyperbole, etc) we enjoyed this very much. She talked about flavor and savor and many other things to do with tasting. 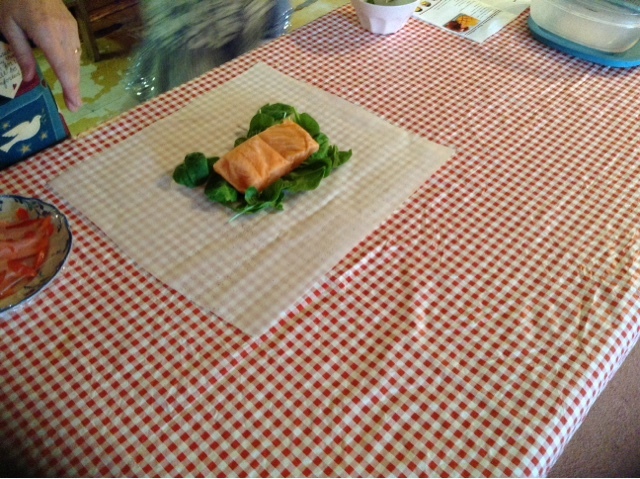 The demonstration included a salad and an entree, which she made and then served to us. 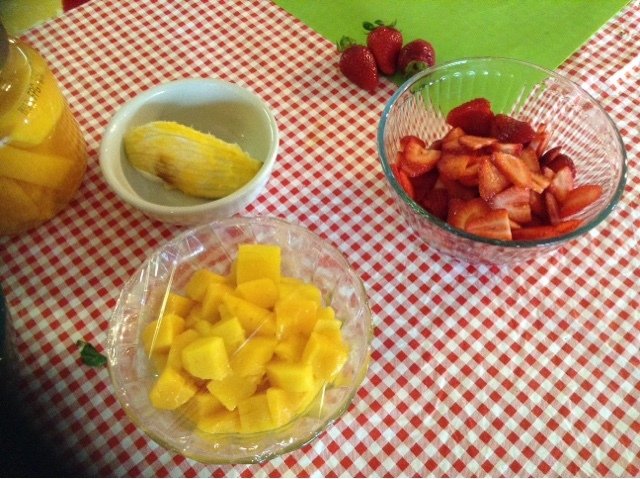 The salad, above, was a mix of greens, strawberries and mangos, with raspberry vinaigrette. 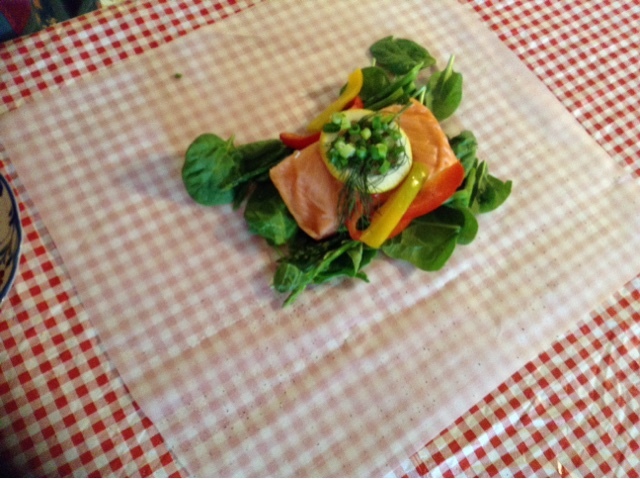 The entree, baked skinless-boneless salmon in parchment, was demonstrated step-by-step. 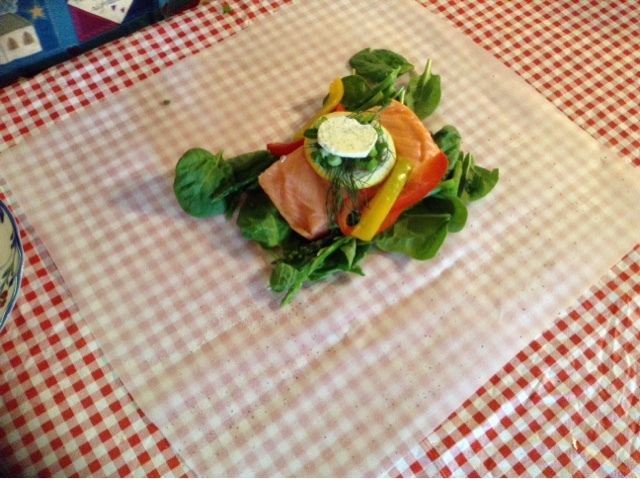 ...and then she demonstrated how to make an envelope out of the parchment baking paper the salmon was prepared on. 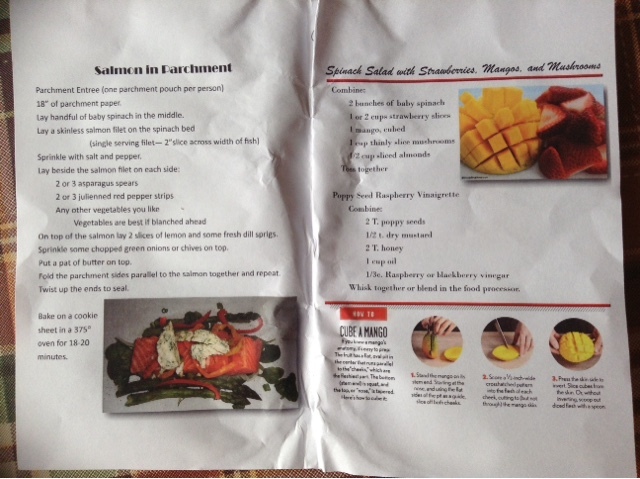 The booklet, below, gives the instructions and oven temperature. One good tip for doing well with cooking, was to wear the cutest apron and dress well, fix your hair, erc. If you try to look as cute as possible, it was emphasized, you will be happier in the kitchen. I am sorry I did not get any photos of the food serve on e plate, but I assure you it was delicious. 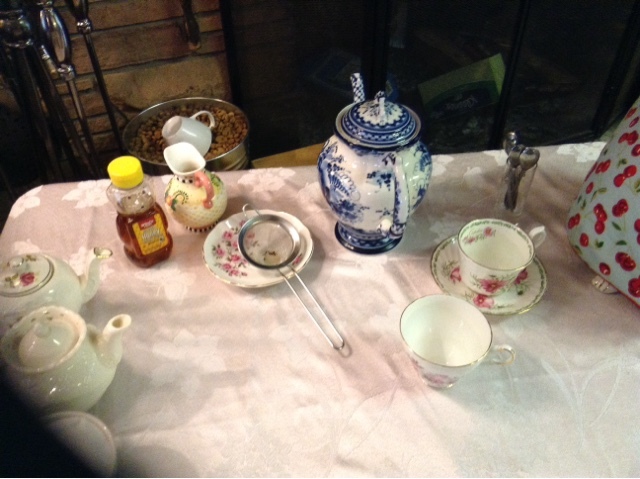 ...and below, a separate tea table which all the visitors frequented before the cooking show and during breaks. She had Yorshire Gold, Raspberry, amd Birthday Cake flavor of pots of tea. I wanted to stay longer after lunch and have a leisurely cup of tea with this lady, (who me my family has known nearly 50 years including church activity) but some of the ladies who were with me needed to get back to the farm and feed their animals. This lady lives way up in the hills and I live down in the flats, in a valley, so it is rare we get to see each other. One day I will take a friend and go visit her and stay longer. Her home is like visiting a lodge in the mountains and I especially relish going there in autumn. 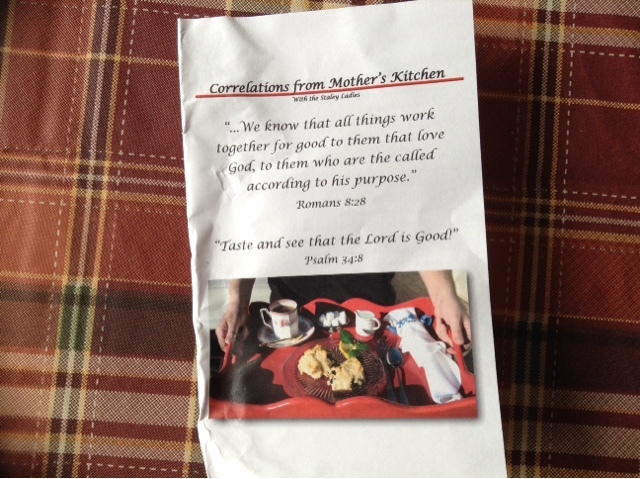 Here is the booklet she made for the event, which I unceremoniously and unfortunately stuffed in my bag. I probably should have ironed it before taking the photo. Let me take a few minutes here to emphasize the importance of hospitality. Some women do a lot of home keeping and cooking and also serve others in churches, but they do not get much opportunity to attend something that is for their own recreation. Our host and her daughters made an atmosphere for all of us that was just right. We may have been able to find a commercial type cooking class elsewhere but it would not have had the same effect as this. We all believe the same things and we were of one accord and enjoyed the fellowship. No one can really describe how renewing this was for all of us and what a blessing it continues to be. I only regret I forgot to film it! 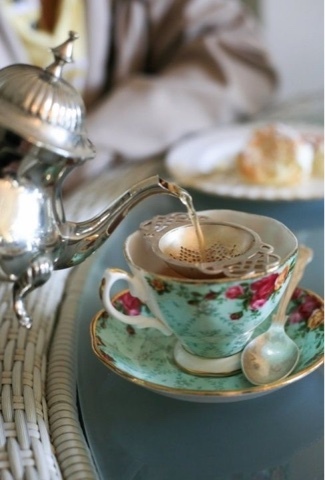 It is so good to be invited to someone's house, even for a cup of soothing tea. So don't neglect hospitality. You do not know the tremendous good it can do. 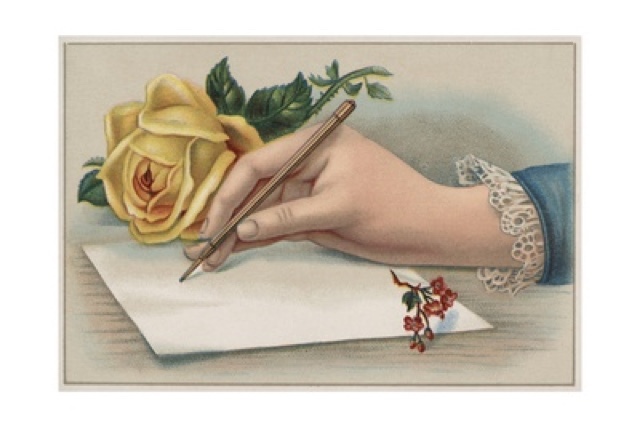 And if you cannot extend hospitality to anyone nearby, why not package up something and send it in the mail for someone you want to bless and encourage. Pack up a box of things that will help someone, and use anything from books, a letter, tea and infusions, maybe even a cup you get at the thrift store, a tea towel, a little mat for the tea cup, some gourmet packaged foods, etc., a musical cd, and so much more you can find for little expense. What about a phone call or a skype visit, or a nice email with pictures? There is so much more to hospitality that many books have been published on various aspects of it. One of the nicest things anyone ever did for me, was when this very same lady came to my house a few days after we moved in. As you know, it was not a good time for company. 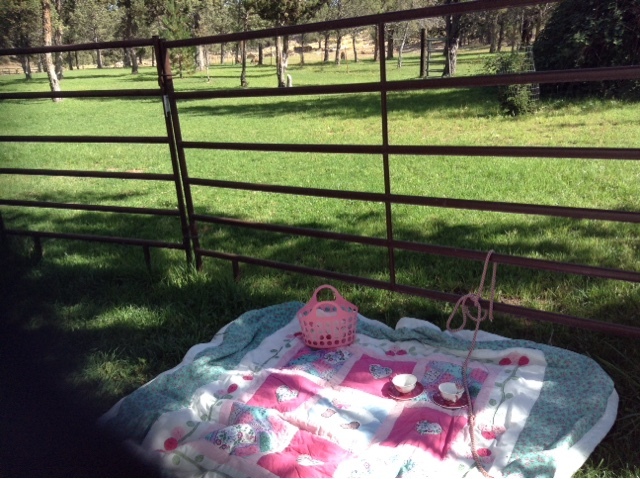 She brought a table and folding chairs, and a picnic hamper full of things for a teatime buffet. She even bout her own hot water to make tea. As I said, we just don't know how hospitality touches people and eases their burdens, their health and their grief. If someone has crossed your mind recently, you might take that as a nudge to extend some kind of hospitality. Time goes by so fast for me and I always have great plans for a post but all the things that need doing seem to crowd it out! Regarding this post, I was waiting til I had a picture drawn of the scene, but it will be some time before that gets done so this is a better-than-nothing post! If I wait to get the painting done, there Ffcpossibly will not be a post for quite awhile, so I thought I better just post what I have. The above photo of the lady arranging her hair is from the movie I reviewed here called Love Finds Ypu in Charm. adapted from the book, "Love Finds You in Charm, Ohio" by Annalisa Doughety. It is about a young lady who is seriously into Jane Austen, and it airs on September 20 on UP TV (Uplifting Television) at 7 p.m. Eastern time, for those of you who have access to television. I do not have television so I will have to wait til it is available on Internet or DVD. I have read the book and enjoyed it very much. 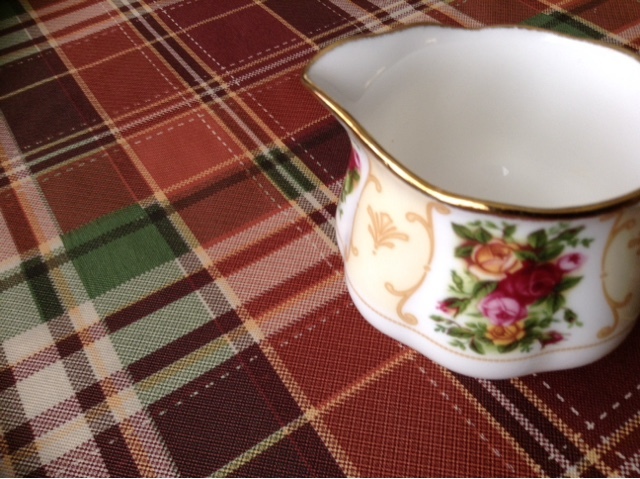 It is available on my other blog, Lovely Whatevers. 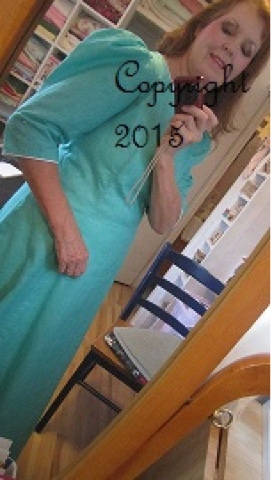 This is my version of the dress, above, in the mirror. This style of mirror also happened to be in the movie. I liked the colors of Emma's garments and when I saw the one that I posted here, I recalled I had cut out something in that color a few years ago. I had lost interest in it and put it away. 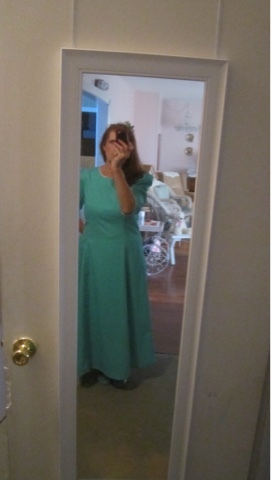 I finished it and added white piping on the neckline and sleeves. 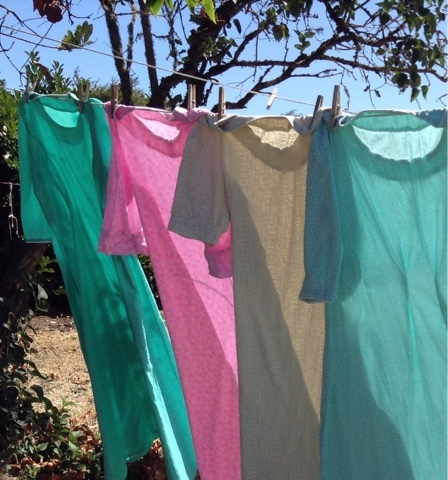 My "line" of clothing: These are four colors I made for the summer, most with added ruffles on the hems. 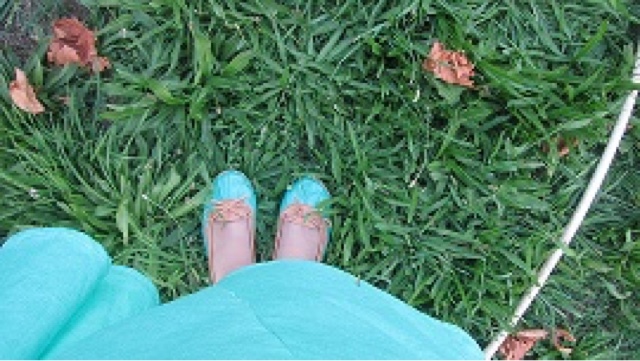 The colors are sea foam green, light pink, beige, and sky blue. 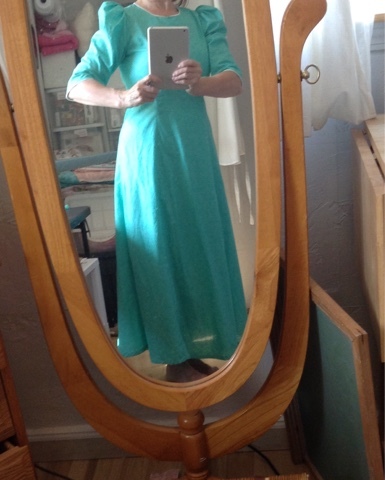 Not ironed yet, but I wanted to quickly out it on the dress form, to show the style and the trim. 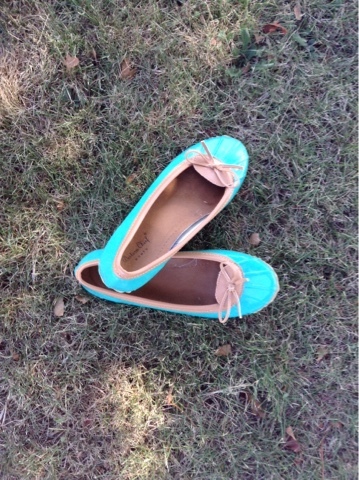 Get a look at these shoes! I found them at one of our cheaper stores and liked them because they matched the dress. They look like the rubber boots we used to wear, only they are very soft and flexible. Below is the picture I am hoping to paint, but I must say I am finding the trellis bench a bit of a challenge, and all those leaves, so I am going to watch the leaf-drawing tutorial before I attempt this as a painting. As I did not keep the pattern in the bag with the cut out dress, I cannot remember which one I used but will post the picture of the pattern envelope when I do. It is princess seam and a slightly rounded V-neckline, with added sleeves from an older pattern. Thanks for coming to see me. It just makes me so happy to read your nice comments. Fabric from Walmart, and there is a pink version of the same fabric. It has a linen-look print, where the threads in varying shades are visible. The shoes are made of rubber and feel As soft as moccasins and the brand is "Western Chief." 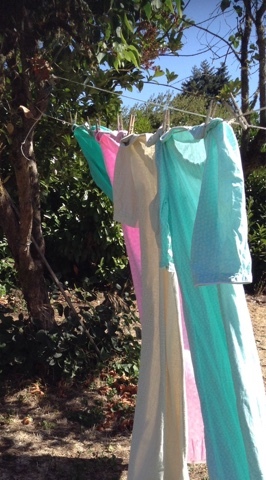 The facings of the dress, illuminated by the ultra bright sun today, do not show through the fabric when wearing. 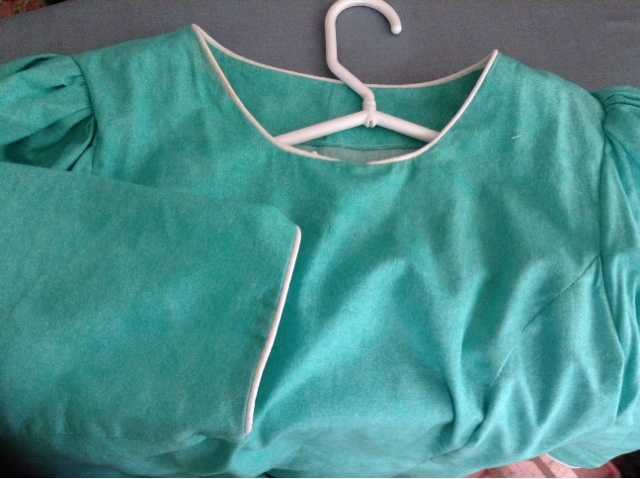 The sleeves vary per garment, and I made these for the home. It is a way of dressing up without being too fancy, and I wear matching aprons with them. 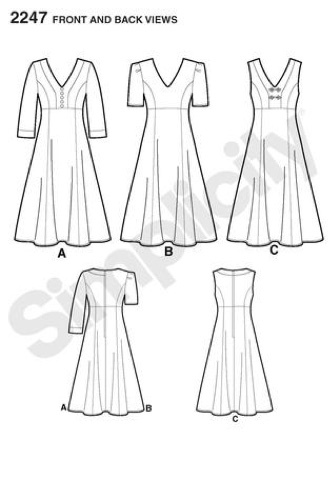 I have not used this pattern so I can't say if it is easy....looks like a lot of pieces...but if I were to choose, I would sew the one, below and use a more Victorian style sleeve or use the sleeve shown on the middle. If I ever had my say about shops in towns, I would have dress shops with a variety of styles and sizes , and give away free dresses for ladies who would be willing to wear them to church, while shopping, or when with friends at home and on vacations, so that they could get feedback on the dresses and give business cards with where they could be bought. 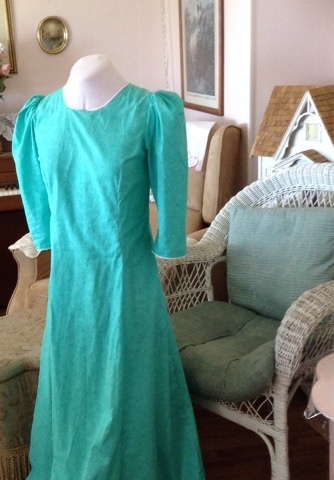 This would include mother-daughter dresses. My daughter and her daughter and I wore a blue floral dress one day while visiting the antique stores and we were always stopped and talked to by everyone, all ages. Little girls and their mothers, and older couples, as well as the young men and young ladies walking home from high school, made a point of telling us what an inspiration it was to see the dresses and the fabric, and liked that they were matching. 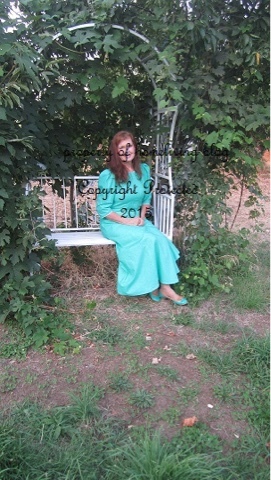 So I know people would enjoying seeing more of these long dresses and would enjoy the seasonal prints and colors. 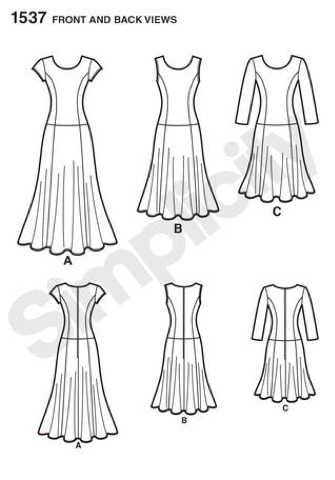 This is a pattern with side front and side back pieces that cause the skirt to fall into two nice pleats in front and back, as you see above. I know not everyone sees, so I want to say that there are ways of doing this with purchased clothing. Just buy a top and skirt in the same solid color, and maybe add a coordinating cardigan.